In this portion of the Ecommerce Shipping and Fulfillment Guide, you’ll learn about three different shipping and fulfillment strategies to consider. Shipping and fulfillment can be one of the most challenging aspects of building an ecommerce business. There are a lot of variables that you need to consider, and everyone’s approach to shipping and fulfillment will be slightly different. 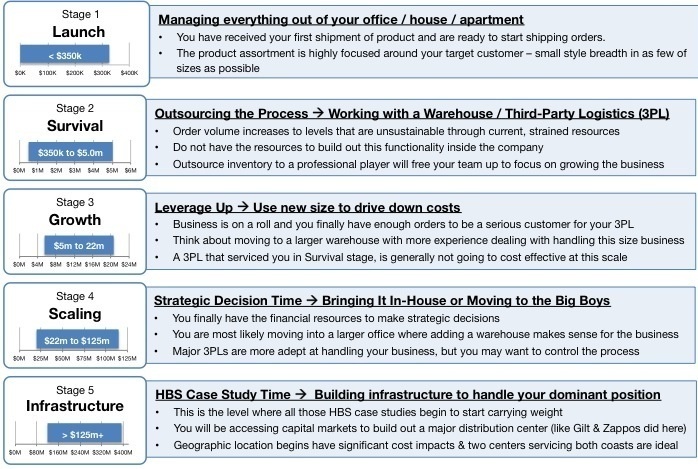 These different factors will play a big role in your shipping strategy. For example, with sites like Amazon, customers expect free two-day shipping. It’s integral to the Amazon brand and experience. 61% of shoppers will leave a website if they don’t offer free shipping. Thanks, Amazon. 51% of people would abandon their cart/purchase if the shipping weren’t fast and transparent. The truth is that your entire shipping strategy will play a role in much more than just getting your product to a customer. It will actually impact your sales numbers and the number of customers who are interested in your product. With that being said, you have a few common shipping strategies to choose from that you can adapt based on your preferences. But before examining different shipping strategies, it’s important to outline what shipping methods will be standard for your business. Once you’ve assessed your shipping timelines, you can pick between a few of the most popular shipping methods. There are a few common shipping strategies that depend on your current business success. For example, if you currently are overwhelmed with recurring orders, self-shipping likely isn’t in the cards for you. Conversely, if you only have a few orders a week, drop shipping or using a fulfillment warehouse isn’t worth the added costs. Here are the common strategies you can pick from for each stage of your business. Shipping yourself is a DIY method that is best for the startup phase of a business. Shipping on your own property and time involves shipping from home, writing labels, and delivering the products/packages yourself to the post office. Essentially, it’s exactly what the name implies: you are doing it all yourself. You aren’t outsourcing or drop shipping through a third-party. You could be packing in a warehouse you own, your garage, or your spare bedroom. The overview listed below uses real-life examples of the process that Matthew Carroll discusses in an answer on Quora. It takes you from a novice doing it out of your own apartment to a seasoned veteran with strategic partners shipping products to your customers. Instead of just repeating what he said, we provide below some real-life examples of what this process would look like in the first two phases. That’s not to say that it is easy for big business to ship goods. But it is a whole lot easier for big business than mom and pop shops to fulfill orders online. That is why this will focus on how entrepreneurs start the process and transition from home shipping to a third-party and more. So, who is most commonly going to find success with the DIY nature of shipping and packing yourself? Bootstrap ecommerce entrepreneurs. People just getting into the game and looking to grow their business from the ground up with few or no sales yet. Not to get too philosophical here, but the quote about a journey of a thousand miles beginning with a single step sums up the approach to shipping for new ecommerce store owners. Most entrepreneurs start with limited funds as they try to determine the best approach to shipping their online products. Their ingenuity helps propel them to come up with creative solutions to shipping their products around the country. Starting small gives room for errors that won’t sink your business into debt too fast. Yet, it also provides the room to test and improve on not only your product but also how you process orders and provide services to customers down the line. It’s a win-win for the new ecommerce store owner. 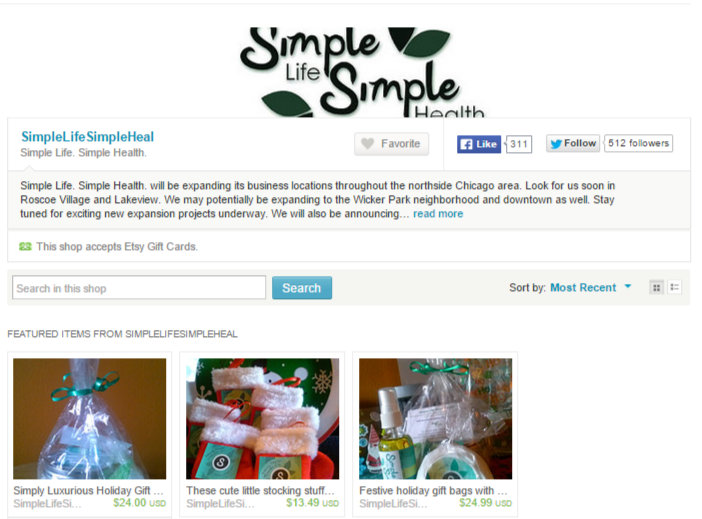 Take Renee Raville and her Simple Life, Simple Health Etsy Store. She sold a number of scrubs, oils, and other natural health products online. Renee did not have a manual or explanations of the best process for shipping her goods. There was nobody to invest millions of dollars in a warehouse or a third-party, either. Instead, she used trial and error to determine how to ship products to arrive on time to customers who ordered from her. Her big secret was simply testing carriers like UPS. The guys at UPS even gave her suggestions along the way. As she did it all herself, she bootstrapped her shipping and fulfillment by packing the boxes and testing different box types and styles to find what worked for her products. Once she located and tested those, she ran with them, shipping her products with UPS when she finished packaging them. Similarly, Bare Performance Nutrition, a supplement company in the fitness industry, still bootstraps their shipping. They do it all on their own directly out of their warehouse. They receive, pick, package, and ship their orders directly from their operation without third-party logistics. When starting out a new ecommerce store online, self-shipping is the best place to start. You can keep costs relatively low for the time being while budgets aren’t huge and mistakes can be costly. All you really need is a printer to create labels, your online store technology, and the ability to order, pack, and deliver boxes to your carrier of choice. The amount of extra money you’ll spend on shipping isn’t all that much. But these amazing pros also come with serious cons down the line. And the biggest potential negative factor of staying in self-shipping too long is the lack of scalability. If you are running a one-person operation out of your garage, handling a few orders a day is nothing. But if you begin to get dozens of orders daily or you’re breaching hundreds a week, handling that type of volume alone is brutal. Why? Storage and time constraints. You need to start ordering more boxes, printing more, and making tons of trips to the shipping location. Scaling becomes increasingly difficult without expensive technology and bigger spaces for storing your boxes and products. To add to those troubles, if your business takes off, the likelihood of being able to fulfill and ship all of your orders will drop dramatically. You don’t have a warehouse with pallets, forklifts, trailer loading docks, expensive picking technology, and advanced label printing. Meaning any high order amounts that flow in could go unfilled, creating a potentially unrecoverable brand disaster when you can’t fill your orders. If you are starting in self-shipping, be prepared at any moment to switch to a third-party service to help you. You never know when growth will come, and you want to be prepared before it happens. Workforces: At a certain point when your business scales, it won’t be feasible for you to keep doing everything on your own. It simply won’t be possible to keep fulfilling hundreds of orders. This means that you have to consider hiring a workforce to help, which is a huge time constraint. Plus, you’ll have to use a big portion of your profit to cover their wages. And on top of all of that, you’ll have to train them on your systems. Storage: Do you currently have enough storage to scale? If not, you are setting yourself up for disaster. Your garage is a great place to store stuff early on. But at a certain point, that’s not going to be enough. You can’t wait until it’s too late, and storage can quickly become expensive. Competitive advantages: Currently, competitive advantages in ecommerce are things like free two-day shipping and delivering your products in a timely manner. Does self-shipping allow you to do that? Does self-fulfillment give you any competitive advantage, or does it hinder it? Processing, picking, packing, and sending your products is a confusing process with a learning curve. Self-shipping is a surefire bumpy road at the beginning that might eliminate your competitive advantages if competitors are using third-party logistics. All in all, if you are just starting out from the ground up, self-shipping and fulfillment is the way to go. Once you’ve started to generate demand for your products, you can now consider a 3PL. After you have survived the launch period and done it all yourself, you will want to start talking to third-party logistics companies to streamline the process. Even if you are just in the research phase, you can learn tons of information that will be critical down the line when making the decision to use a third-party service. Consider the online retailer ShoeDazzle, which celebrity Kim Kardashian helped start. I know this might be hard for some people to hear, but I dare to say it: Kim does not personally ship out every pair of shoes that is purchased on her site. Spoiler Alert! In the UK, the third-party logistics (3PL) company Clipper Logistics handles the shipping for the company. Companies like Clipper will work with your business to help you ship products across multiple sales channels. Having an outside partner helps expand your brand faster by off-loading the tedious work and ensuring that all products are delivered to customers speedily and on time. This makes it possible for Kim Kardashian to sell products without packing and shipping from her own home or workspace. If you are tired of boxes upon boxes stacked up in your living room, then you will want to consider a 3PL company to simplify the process for you. Instead of sending out orders individually as they come in, you send out regular shipments a few times a month to your logistics company. Then, the logistics company sends out the shipments to your clients. Software like Lettuce App can help you integrate this process with your checkouts on Shopify. So, how exactly do these third-parties work? While it will obviously cost a pretty penny to use a third-party logistics service, they provide huge benefit when it comes to these key factors. Plus, taking the bulk of the work out of your hands gives you room to focus on growing your business rather than packing boxes. If your company grows large enough, running everything out of your house will probably become impossible. Storing your products in your garage might work for a little while. But after you generate hundreds of orders a week, it’s likely not an option anymore. Depending on the company you work with, they will charge you by pallets, cubic foot, or other common metrics. Receiving fees are simply the costs associated with having to receive, unload, and properly store, organize, and inventory your products. Next, third-party logistics will take care of the picking, packing, and shipping of your products. In the picking stage, 3PLs will navigate to the proper storage location of their warehouse to literally “pick” your product from the shelves or pallets and transport it to the packing area. After picking, products are usually packaged in the 3PLs own packaging choices. Lastly, your 3PL will calculate shipping rates based on box sizes, product weights, and the distance they travel. To summarize, third-party logistics (3PLs) handle everything on the back-end once an order is placed. They are a great option for growing businesses that don’t want to undertake their own warehouse just yet but have outgrown their garage and home. Third-party logistics sound like a dream come true, right? They do all of the time-consuming, “boring” work that we don’t want to do: picking, packing, shipping, inventory, etc. Plus, 3PLs have cheaper shipping rates with carriers as they ship in huge volumes with multiple companies that use their services, which gets you discounted rates. With an automated process, you handle less of the back-end work and reap the rewards of cheaper and faster shipping. This frees up major time for you to work on continually scaling your business and getting more customers through the door. Often no long-term leases or commitments are needed. This is great for testing the waters and experimenting with new companies. You can be sure that you are offloading risk and gaining a reward. No labor expenses! As we discussed in self-fulfillment, you will outgrow your garage and your one-person or two-person operation at a certain point. 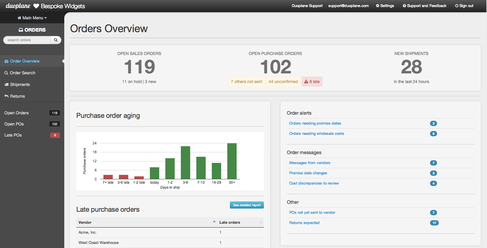 As your order volume increases, you won’t have enough time to fulfill all of your orders on your own. You will need to expand your labor force, and that requires time to craft a plan, hire, train, and pay them a fair wage. Labor is a brutal expense of time and money that you can save by using a 3PL. More time for what matters. 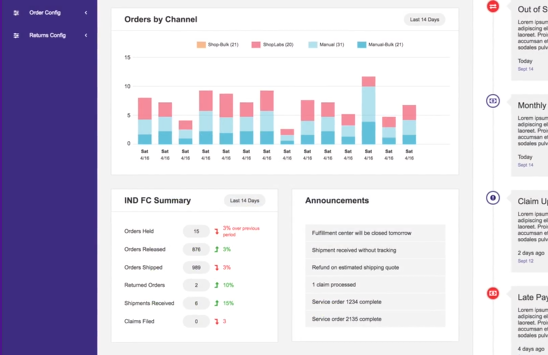 With a 3PL, you don’t have to spend time processing and fulfilling orders anymore. This means that you can spend your time on growing your business and producing more orders for your 3PL to fulfill. You can now focus on growth rather than putting it second to making sure that your orders get delivered on time. But these great benefits also have a few downsides. For instance, it’s a huge extra expense to hire third-party companies. With charges for every step of the process — from receiving to shipping and everything in between — costs can stack up fast. On top of that, tons of 3PLs will use their own packing materials, which gives you less control over the branding experience when your products get shipped. Depending on which 3PL you go with, you will likely have to pay extra if you want branded boxes. How do you pick a fulfillment company? Fulfillment companies can be a great way to scale your business fast and are perfect for the growing small business that can’t use a garage as a business anymore. But where do you start? How do you find the right company that you can build a real client relationship with? One that’s trustworthy and has good reviews and a great track record for delivering products on time? First, you can start by looking for companies with industry specialization. This means looking for a 3PL that specializes in specific markets, such as clothing. There are some 3PLs that only work with companies within their market, whether it’s clothing, perfume, sporting goods, or any other product-based industry out there. To start, you can head to Google and search for third-party logistics based on your industry. Doing these industry searches is an easy way to narrow your search and look for specific providers in your industry. But if you can’t find any, don’t worry. Instead, you can look at 3PL companies and their clients to see if they have any clients that are similar to your business. For instance, if a 3PL isn’t specific to the industry but has tons of clothing clients like you, the chances are good that they have a great system for your business too. To do this, simply look for testimonial or customer success story sections on the website you are viewing. Analyze each one to assess which industry their business occupies, giving you a clear idea of how the 3PL works and what customers they cater to. When choosing a new 3PL to work with, there are some key things to look for. Don’t jump the gun by selecting the first one you see. When browsing sites and different companies, look for clear outlines of what services they provide. Do they just cover warehousing and shipping? Or do they pick and pack only? Do they cover full supply chain management and even accounting? Depending on your needs, these features are key to success. While you may not need accounting, it could actually provide you with an extra service that you don’t have to worry about, which frees up more time on your schedule to focus on growing your sales. Always look for a list of benefits when exploring each company. Choosing the right 3PL for your company to partner with can be stressful. Examining benefits, features, and costs can be time-consuming when you don’t know where to start. But thankfully, we’ve compiled a list of three of the top-rated and reviewed 3PLs out there. By using this list, you can compare features and benefits to make a decision that helps your business grow. Analyze their strengths and weaknesses and make your decision from there. For example, what partners are best for the startup phase? What about a small business that wants international shipping? Or even the Amazon focused seller? We have all three for you. FedEx is one of the most reliable shipping carriers on the planet. With international shipping and tons of money-back guarantees, they have a great track record of success. With FedEx Fulfillment, you have access to over 130 fulfillment warehouse locations in the United States and hundreds of international distribution sites. Since it’s already a carrier, you get the cheapest shipping rates and direct access to their systems for delivery and tracking, which means that your shipping will always be consistent. 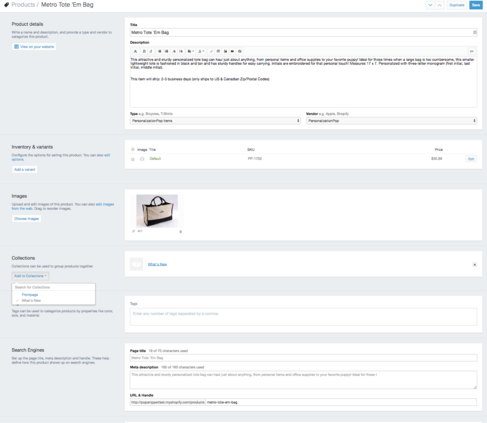 Instead of having to upload your inventory or store data, you can simply link it based on your platform. Unfortunately, they don’t have any pricing information available to the public. 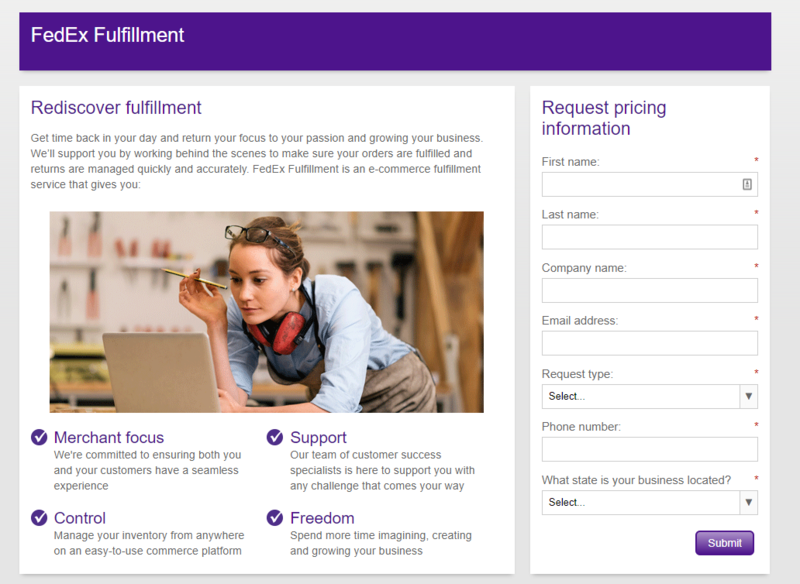 To get pricing, fill out a request for information on their fulfillment landing page. One potential downside of FedEx fulfillment is the lack of compatibility with Amazon prime. This means that you can’t use them to offer two-day shipping and have that coveted “Prime” label on your Amazon store. So if you sell on Amazon, this might be a dealbreaker for you. Otherwise, it’s one of the best fulfillment companies to work with. If two-day shipping is a dealbreaker for your business, then look no further than ShipBob. 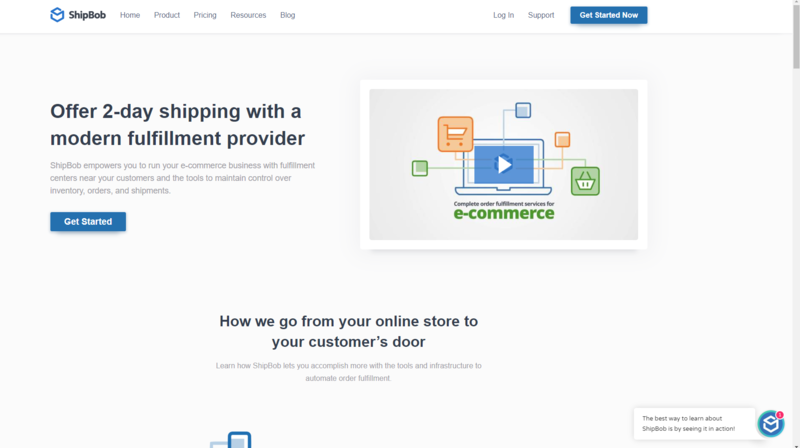 ShipBob is great because they have access to countless warehouses in the United States and abroad, making it easy to deliver products in just two days every time. This is great for you because it reduces your shipping costs by requiring less travel distance. As an added benefit, you can offer faster shipping, which is a surefire way to improve sales and cart abandonment rates. So, how exactly does ShipBob work? The first step in their process is connecting your online store to their platform. Using strategic placements, they split your inventory based on destinations to cut costs on their end and, subsequently, your end. When a customer places an order, ShipBob processes it by picking, packing, and shipping it to the customer. With their automated systems, they email tracking information to you and the customer the moment an item is shipped. ShipBob is best for businesses who are seeing great growth yet are still in the small-business phase. 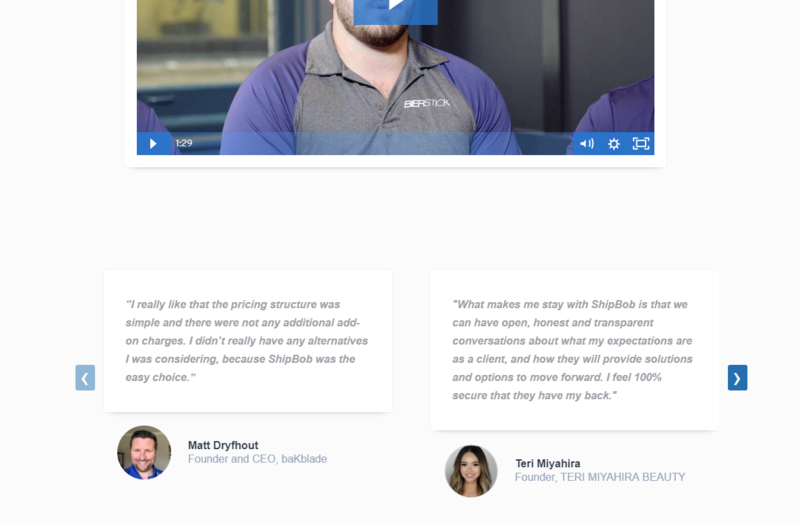 If you are growing steadily and looking to improve shipping quality, ShipBob is a great platform to use. They make life easy by integrating with multiple online store platforms so that all of your data is interconnected. Their platform is very intuitive, too. If Amazon and Amazon Prime are your bread and butter, you should consider Amazon’s own fulfillment program. Fulfillment By Amazon is more than just a picking, packing, and shipping partner. They actually have amazing tools and even dedicated agents for your company to help you grow your sales. Because if you grow your sales, Amazon grows theirs, too. They are genuinely invested in the growth of your business, and they provide endless support and tactics to help you do just that. With no minimums on fulfillment, any business can take advantage of it. With a “pay as you go” system, they only charge you for storage and orders that you take up and fulfill rather than making you pay flat fees for services that you might not use. Using FBA also guarantees that Amazon will list you as a free two-day shipping merchant with Amazon Prime! First, you link your current product catalog including SKWs and product information into Amazon’s database. Then, Amazon catalogs your information. Next, you send your products to Amazon for them to store in their warehouses nationwide. From there, Amazon will pick, pack, and ship your orders the moment they are placed, and they’ll give a Prime two-day shipping guarantee. Handling the customer service for your business on both product and return support. This is a huge benefit since customer service is key to success but can take up tons of time and additional labor. Instead, let Amazon take care of it for you. If you sell a lot (or plan to) on Amazon, stick with their tried-and-true platform for easy setup and quality handling. Drop shipping has exploded in popularity in the last few years, which has enabled anyone to get into the ecommerce game without huge fees or blowing their budgets on inventory that they never sell. Drop shipping is selling products without ever directly handling them or fulfilling the shipment to the client. By using a third-party manufacturing and fulfillment center, a retailer or an ecommerce merchant is able to ship the goods without losing time. They also never have to carry the product. For example, you can partner with a fulfillment center and buy products directly from a wholesaler. Once orders start to come in, you forward them directly to your supplier. The wholesale supplier then fulfills the order and ships the products directly from their own warehouse, charging you only for shipping in the process. To go past the textbook definition, here are some examples of how entrepreneurs use drop shipping for their businesses. Testing: There’s nothing worse than the greatest idea in the world that does not work. Instead of starting by spending a small fortune on creating your product, start testing how it would work with other people’s products first. 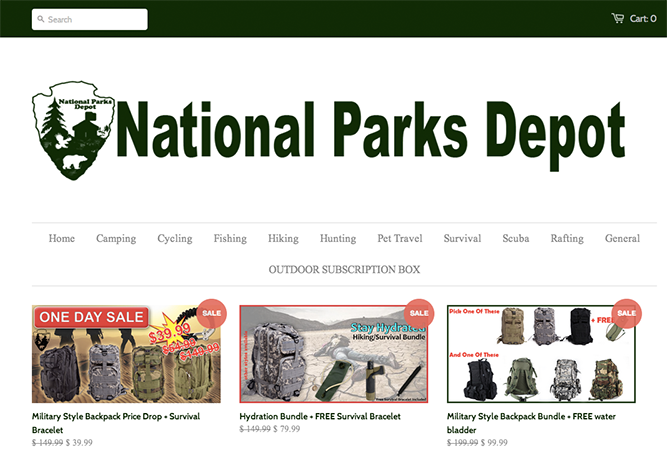 Many retail stores use drop shipping to see how their audience will react to products sold on their websites. It is also a great way to expand into new lines or offerings for your business. Lifestyle entrepreneur: Maybe you are not looking to create an empire with your ecommerce store. Perhaps you just need to make sure extra money. Take 22-year-old Kelan Kline. He started selling goods on Amazon and eBay at the ripe, old age of 14 after his parents told him to get a job. After selling everything in his home, he started using drop shipping to sell additional products. Talk about a great way to supplement your allowance! He sold over $70,000 of goods over the course of eight years. Bootstrappers: Let’s be honest: one of the biggest reasons most entrepreneurs get into drop shipping is because of the money (or the lack thereof). Drop shipping helps thrifty entrepreneurs start their ecommerce empire without a serious financial investment. Take Robert Nava, the owner of National Parks Depot. Robert is an ex-con who leveraged a small Facebook page where he shared daily pictures of National Parks. He turned it into an ecommerce store worth $80,000 per month. When he started, he was not even able to pay the rent. He had to work out an arrangement with the landlord. He had no products to sell and turned to drop shipping to turn his life around. However, not all bootstrapping is limited to startups. Businesses that are past the startup phase can also use drop shipping to avoid tying up their money in inventory that’s just sitting on the shelf. Expanding businesses: Finally, let’s talk about the empire makers. These entrepreneurs have the vision to go big or go home. From that small website, they were able to grow their business from a single site to a company that now sells over ten million products across 10,000 suppliers. In 2013, they were one of the largest drop shipping ecommerce stores in the world with over $900 million in annual revenue. 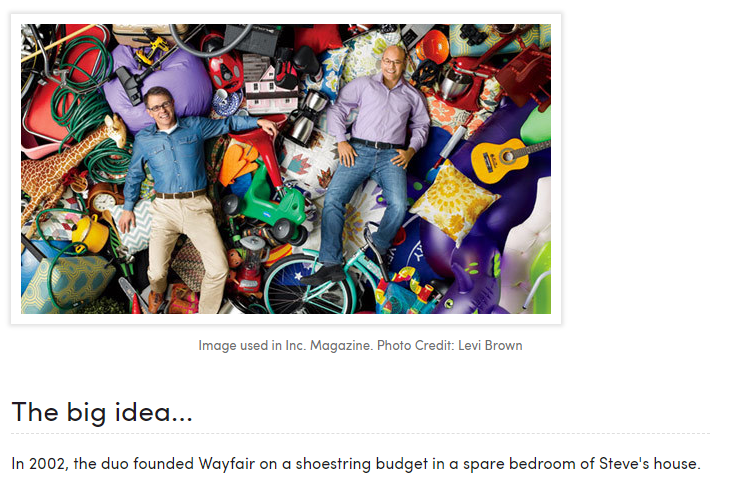 Wayfair viewed drop shipping as a way to grow their business faster than they could have ever done on their own. What are the drawbacks of using drop shipping? Drop shipping is a great strategy, but like any other strategy, it has its drawbacks. First, drop shipping can be competitive. Beware of getting into an over-crowded field. This can be disastrous if you do not pick your niche correctly because your competitors will swallow you up. In essence, discover how you can differentiate yourself from your competitors. Ask this question at least once a month to ensure that you are staying ahead of your competition. Second, you are not completely in control. The great thing about drop shipping is that you do not have to ship products to clients. It can also be your Achilles heel if something goes wrong. For example, Vanessa D. was a power seller on eBay. On her blog, she talks about how a drop shipping company tanked not only a sale but also future sales on eBay. This happened because one buyer had to wait four weeks to receive their product after the manufacturer ran out of inventory. In the end, the reviews from this and another low rating placed her lower in the matched search on eBay. This, in turn, crashed her sales from 40 per day to zero. While not all drop shippers are this careless with their sellers and merchandise, do your homework on your vendors and suppliers when starting in this business. Now that you understand the potential risks with this shipping type and business model, let’s talk about how to do it right. While the drop shipping arrangement will differ depending on which manufacturer you are using, here are some broad guidelines to follow. Incorporate your business: Most manufacturers will not work with individuals. Instead, they prefer to work with a company. They want the security of working with a professional. While I am not an attorney, nor do I pretend to be one on TV, here are a few basic facts you will want to know about incorporating. Your best option for an ecommerce site will be either an LLC or an S-Corp. If you use an attorney, ask them for recommendations. Costs for setting up an LLC or corporation will vary. I once set up an LLC in Wyoming with a registered agent for $100, but the average cost will be closer to $500-$2000 depending on attorney and state filing fees. In my case, I was a member of LegalShield®. This is a network marketing company for people who need attorneys. You can call up attorneys in any state, and they will guide you through the process and review a certain number of legal documents each month. I probably called up an attorney every single day for about two weeks to get this set up, and I only paid $50 for the monthly LegalShield® fee. 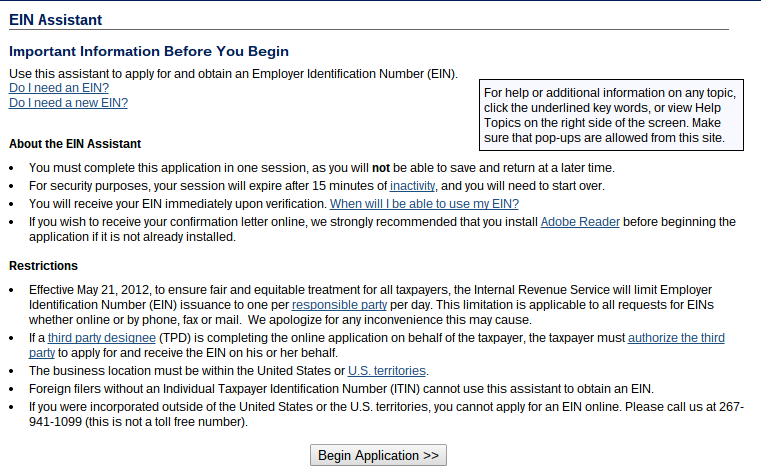 When setting up your business, make sure you get the tax ID, otherwise known as an EIN (Employer Identification Number). This is a social security number for your business. The manufacturer will need this number. Now that we got the boring legal stuff out of the way, let’s talk about what you are going to sell. What is it? Who will want it? If you cannot answer these questions, you will struggle to win business. Finding the right clients could be an article in and of itself. That must have been why Shopify Nations wrote the Step By Step Guide on Setting up a Successful Ecommerce Store. Until you have a niche, you are just playing Pin the Tail on Donkey. Sometimes, you hit the donkey. But more often than not, you look like one. Do your homework to find the right niche. Some useful guides to help you are How to Research and Spy on Your Competitors and 14 Free Keyword Research Tools for Your Ecommerce SEO. One thing that I disagree with him on, however, is customer service. Many lifestyle entrepreneurs use drop shipping to save time. But if you do, do not skimp on customer service. Ferris will tell you to automate or outsource the process. That might work when you get larger, but as you get started, you should field all or most calls yourself. Use customer service as a way to learn more about what problems your customers are facing. Then, include this information in your frequently asked questions and continue to add detailed information about each product for your clients. How you treat your customers is an indication of how well you will do in business. 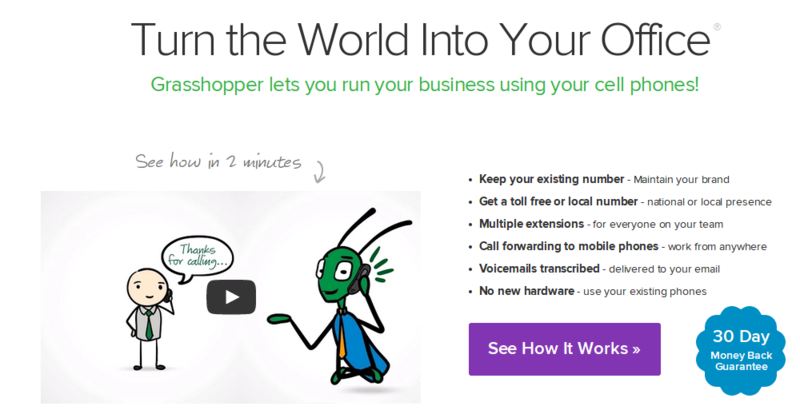 Start by signing up for a service like Grasshopper so you can separate business calls from personal calls. I am sure you love phone calls at 3:00 AM to discuss whether you have a warranty on your product or what the return policy is. Or not! Get a 1-800 number to save you the hassle and provide that need separation in your life. If a phone number still scares you, then at least use a support ticket system. Remember that keeping customers happy is crucial to repeat business. Shopify offers several ticket support apps like Support Ticket Plus and Reamaze to help you answer customer questions online. Set up a Shopify website– Next, set up your Shopify website, so you can easily add your products and make them available to eager buyers online. Check out Shopify’s support documentation, so you can easily set up a Shopify site in minutes. Keep in mind that you will want to set up a site specifically for drop shipping. Sometimes, your vendors might have specific suggestions on themes and plugins you will want to use for your site. A small bit of advice here: Listen to them. Do not reinvent the wheel because they might have certain integrations that will integrate your system more effectively. Seed capital– The great thing about investing in an ecommerce drop shipping business is that you do not need major investment. However, to do this right, you still need money for setting up your website, incorporating, marketing, and sales. Andrew Youderian started his million-dollar revenue drop shipping business for just $1,500. However, costs will vary based on the type of shop you set up and your arrangement with your vendors. Research how much money you need to start your ecommerce store. Find out what the costs will be for your website, drop shipping, listing fees, hosting, security, customer service, legal, and other administration fees. While finding the right manufacturer or vendor can sometimes be challenging for entrepreneurs starting out in the field, here are a few companies that will make the process easier for you. When you use one of these companies, be careful that you are not completely reliant upon them for the success of your business. 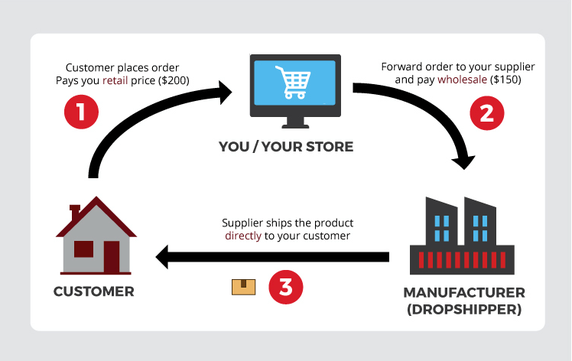 Here are a few drop shipping companies that can help you get started. However, if you are looking to get into a very niche field, you might have to do more research. Doba – They specialize in helping entrepreneurs affordably start drop shipping. Unfortunately, Doba has mixed reviews. Some really like the large selection they offer, and others feel that they do not have the best merchandise or pricing. They do have over 2 million products and a good track record for shipping items out to clients. Dropship Direct – They’re an alternative to Doba, and they have over 50,000 retailers. 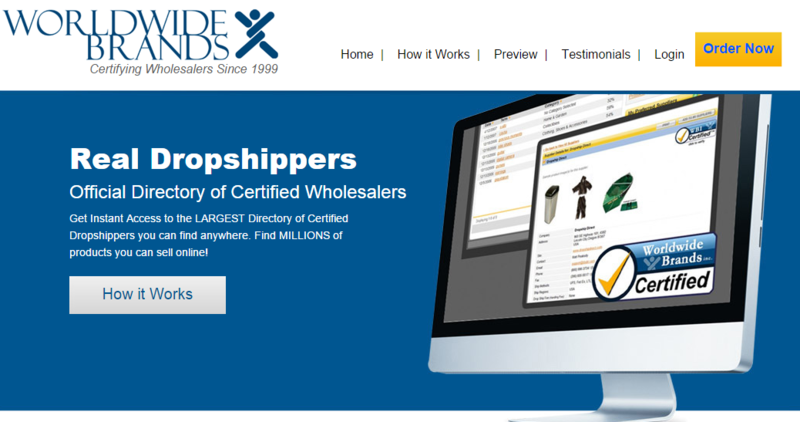 Worldwide Brands – This drop shipper works with top-name brand companies to help you sell their products online. They also have a close connection to eBay. Amazon Seller Central – If you want to sell goods through Amazon, you will want to look at Seller Central. This is not just for drop shipping but also for Amazon fulfillment. eBay Approved Dropshippers – While eBay is not a direct drop shipping company, they do allow you to work with their list of approved dropshippers on eBay. Most drop shipping companies have their own policies and rules for drop shipping items to clients. Make sure that you have a clear agreement with them so you know exactly what level of service your clients will receive with your vendor. And even more importantly, make sure everything you do complies with federal guidelines. One important law is the “30-day rule” from the Federal Trade Commissions. If you are selling products online, you must deliver them to the client within 30 days of the money passing hands. Since you are not able to fulfill orders yourself, it is important to know the drop shipping company’s turnaround time. To help you avoid quagmires like this, we created a list of ten questions you can ask potential drop shipping partners. Does the company charge to work with you? What is their refund policy? How many other merchants are selling their products? Are there any marketing or sales restrictions for selling their products? What is their turnaround time? Are there any charges or fees you might be responsible for if the client defaults? Do they handle customer service and support calls? How do you submit orders to them? Can you track the orders? Is it possible to let the clients see the processed orders? Will the orders appear as if they were from you or the manufacturer? Just because you have an agreement in place, that does not mean that your job is over. The biggest mistake new ecommerce store owners make when using drop shipping is not monitoring what happens after the sale. In some respects, this is more important than what happens up to the sale. As we discussed above, good customer service is everything. Ensuring that the goods reach your clients in a timely manner is crucial. Check with your vendor to see if they can help you set up a system for proving shipping alerts and timely deliveries. If possible, see if you can integrate the status with website access from your Shopify site (see apps below). Finally, make sure everything is delivered as promised. Here are some apps to make drop shipping easier on Shopify. Duoplane – This app helps you manage multiple orders across multiple suppliers. You can automate your order processing, bookkeeping, and inventory updates. PersonalizationPop – Like Duoplane and ShopiDrop, PersonalizationPop also helps with automating your drop shipping. However, they also have over 10,000 items of their own catalog that you can add to your store. Which one is right for your business? When you begin your new business, it’s usually a good idea to begin by shipping your initial orders yourself. This allows you to better understand the many elements that come into play when shipping products. It further helps you refine operations and better control your brand while you scale your business. Since your order volume is low in the beginning stages, outsourcing to a third-party logistics company is going to be way too costly. You simply won’t be able to afford it yet. It might seem frustrating to pack and ship yourself. But when businesses are small, that’s the only way to remain profitable. Most businesses have stages of growth that go from shipping yourself to automation to fulfillment. Start small by doing the shipping and fulfillment on your own. Once growth ramps up from the beginning phases, you can seek a third-party logistics company. If you hit it big, taking over the logistics in your own operation will be your best bet. But before you can do that, you have to know how to charge your customers efficiently and effectively for success. Shipping and fulfillment are one of the most complex aspects of any ecommerce business. Where do you start? How do you start? What shipping methods are best for your sales and bottom line? When you’re just starting out, sticking to a self-starter method is the best route. It allows you to save money on expensive third-party logistics companies while you can still handle the current order volume. Self-fulfillment is a great starting point because you don’t need to waste money on a service company when orders aren’t bogging you down. That would likely negatively impact your bottom line. Third-party logistics are great when your business starts to grow beyond your home or garage. If you can’t handle the number of orders or the storage for your products, that is a sign that it’s time to scale! If neither of those appeals to you, there is always drop shipping — a method where you never hold the inventory and shipping responsibility. Instead, you can sell products that suppliers and warehouses hold for you. They’ll do all the work behind the scenes. While each of these has pros and cons, it’s best to start out doing it yourself and switching to a new method once you start to scaling business.